Do it for the omega-3s in water-packed tuna. Do it for the anti-inflammatories of fresh ginger. Do it for the way wasabi clears your sinuses during cold season. Do it for the bright flavors of fresh garlic and creamy avocado against the savory tuna. I usually like to make a big batch of this tuna salad so I can have lunches ready to go for several days. Start by chopping up a small bunch of scallions and a very small sweet red pepper. I used about one-third of a red bell pepper, but if you can find sweet mini peppers, that would work, as well! Now grate about 1″ fresh gingerroot, or enough to make 1 tbsp. grated ginger. Don’t even think about substituting dried, ground ginger for the fresh stuff. Mix the chopped veg and grated ginger with minced/pressed garlic, real mayonnaise, prepared wasabi, and two cans of water-packed white albacore tuna. Seriously, don’t go for a lower quality tuna. 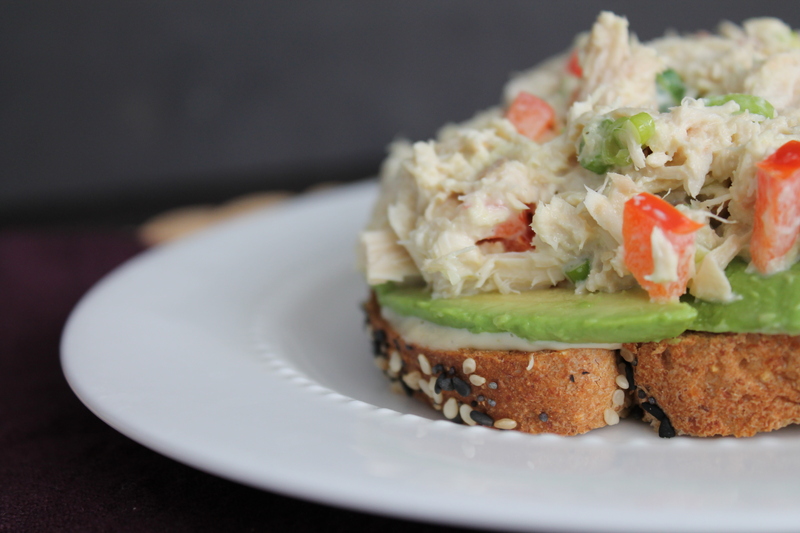 Canned tuna has enough problems; use the best stuff you can find. If it is already shredded into a pulp, your sandwich will lack texture and no amount of wasabi or ginger will be able to undo the funky fishy flavor. Wasabi is a root that is related to horseradish. It’s spicy, but it doesn’t burn your tongue and throat: instead, it gives you a hit to the sinuses. Since the root doesn’t grow well in the U.S., a lot of wasabi served in the U.S. is actually horseradish dyed green. If you live near an Asian market, you might be able to find authentic wasabi, powdered or prepared. But I, personally, don’t think it’s worth distinguishing for the purposes of this sandwich. Real wasabi and imitation wasabi taste similar and give a similar spicy brain freeze. Use whichever one you have easy access to, and don’t forget to check the international offerings at your local grocery store! Mix everything together with a fork, flaking the tuna a little as you go. Don’t forget lime juice for acidity, and salt and black pepper to taste! Now make your sandwich. To be honest, I usually eat this open-face to save a few calories. My metabolism moves at the speed of a slug, so I like to cut a few corners where I can and eat cookies to make up the difference. No matter whether you do this open-face or go more traditional with two pieces of bread, you are in for a bit of a messy lunch. Toast your bread. (Especially in the case of an open-face sandwich!) Slather it with a little of your favorite spread. I can’t get enough of this garlic aioli made by Stonewall Kitchen. One day I will make my own garlic aioli, which is basically a garlicky mayonnaise, but for now, that stuff is amAzing. 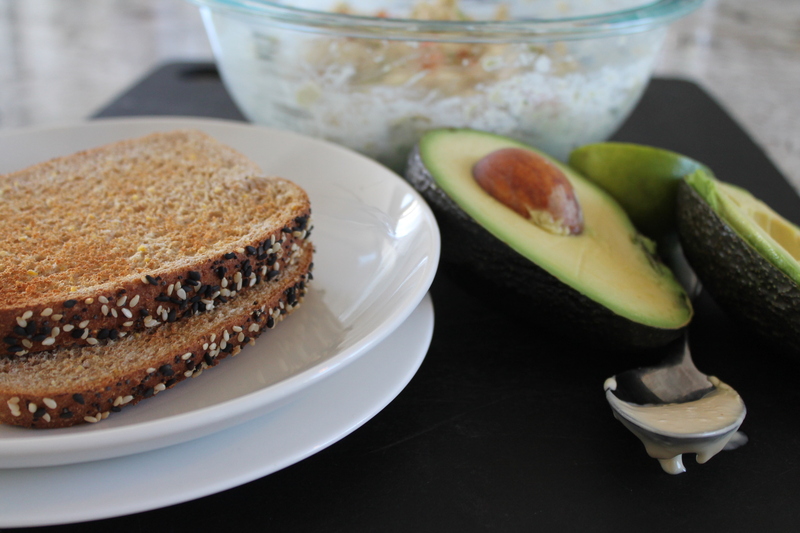 Slice an avocado as thinly or thickly as you like and layer it on your bread. Top with about a quarter of the tuna mixture, and then some clover sprouts! I love the extra bit of moisture and crunch from the sprouts, but the sandwich is also delicious without them. 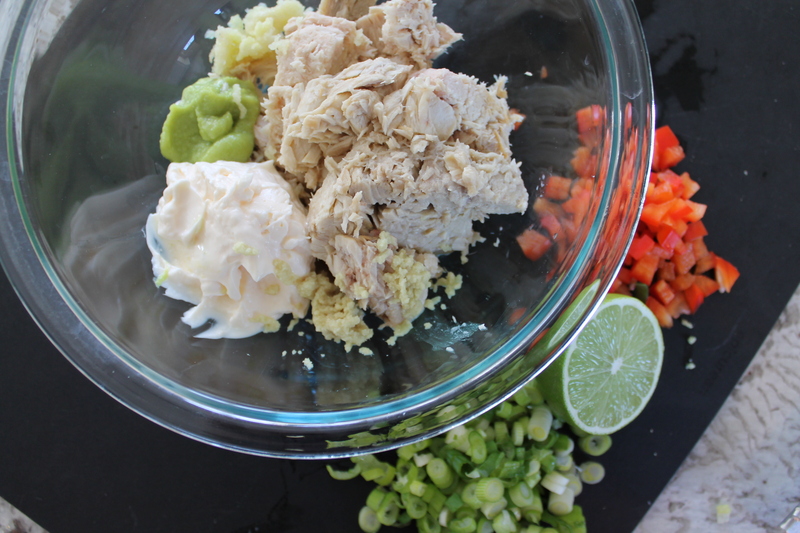 With a fork, mix together tuna, mayonnaise, wasabi, scallions, bell pepper, ginger, garlic, and lime juice. Season to taste with salt and pepper. Toast the bread (this sandwich is good open face as well as with 2 slices of bread!). Spread each slice with 1–2 tsp. garlic aioli. 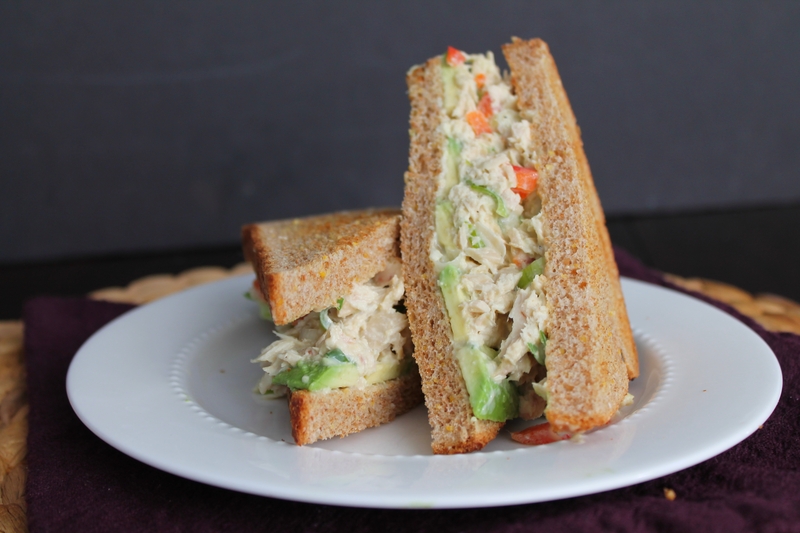 Layer avocado slices over 4 slices of bread, then top with one-quarter of the tuna salad. * Finish with sprouts, if desired, and a second slice of bread. *Note: The tuna salad will keep up to 1 week in the fridge in an airtight container. 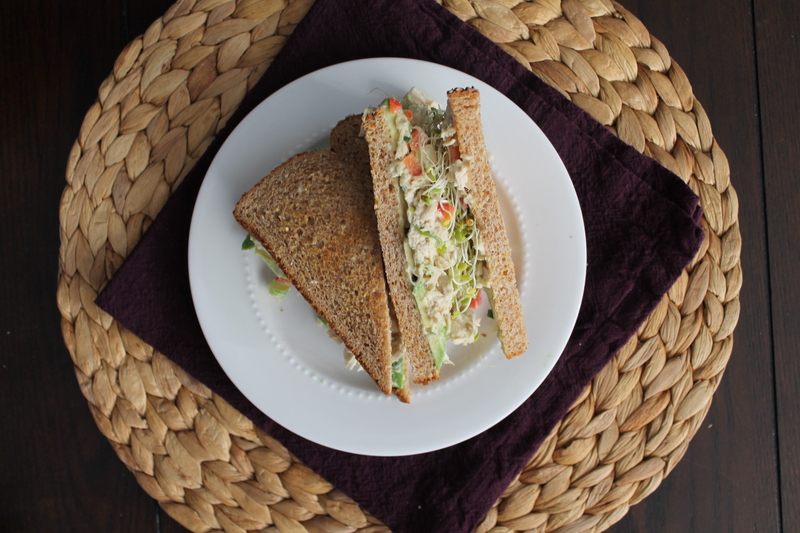 Feel free to make only one sandwich at a time and save the rest of the tuna salad for later meals! I didn’t know that about wasabi, which I really like! Maybe I’m really liking horse radish??? 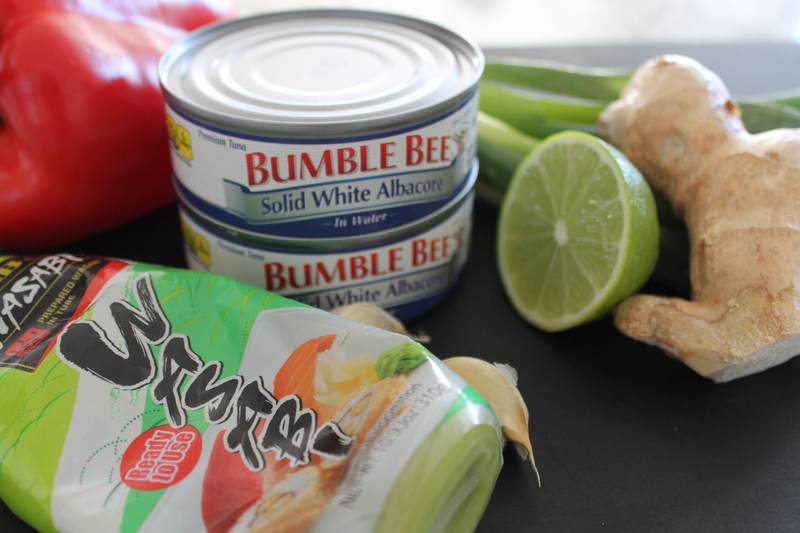 Glad to see that you buy the white albacore tuna, the only safe tuna to eat in any quantity. I love a tuna sandwich and DM always thinking of ways to jazz it up. This has inspired me, thank you.